In previous posts [ here ] and [ here ], I talked about how my Purdue Ankle Biter bees like to rob from dying neighborhood hives that had been infested with varroa mites, and then would bring mites back to their hive where the virulent mites would destroy the hive. I had been doing sugar shake tests about every 6 weeks or so and what I’ve learned the hard way, is that during robbing season that’s not often enough to test. I spent about 8 weeks trying to recover this hive with no success. Maybe if I’d caught it when they first started to rob, I could have gotten ahead of it, but right now I really don’t know. This hive was one of the new breeds that deal with varroa pretty well. At the peak this summer, with no treatments, they never got above about 2 varroa/100 bees. So seeing the hive taken out by a varroa bomb has been really disheartening. 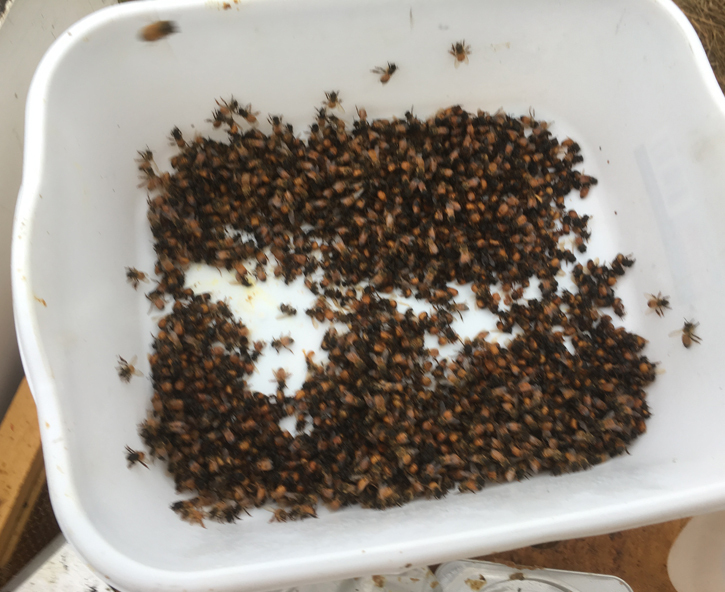 In talking to or listening to other beekeepers who have had similar experiences, I’m not sure what can be done once a hive has been varroa bombed. In the future, I’ll test more often, cage the queen to break the brood cycle, and use formic acid at the start. If you’ve had success in recovering a seriously infected hive, please let us know about it and what you did. My other 5 hives are doing well, and I want to keep them that way, so this one had to go.